Let your personal style roam free with the Hometrends Accent Chair, which features an eye-catching zebra print — a look that’s sure to be the center of attention. This comfortable chair features elegant hardwood legs and striking, animal-inspired zebra print wrapped around the firm seat cushion. The woven polyester upholstery is soft to the touch and easy to clean. Place this zebra print chair next to a window for a great place to read, or next to the coffee table for a comfy spot to lounge while watching TV. It also makes a great accent chair to place at your vanity table. 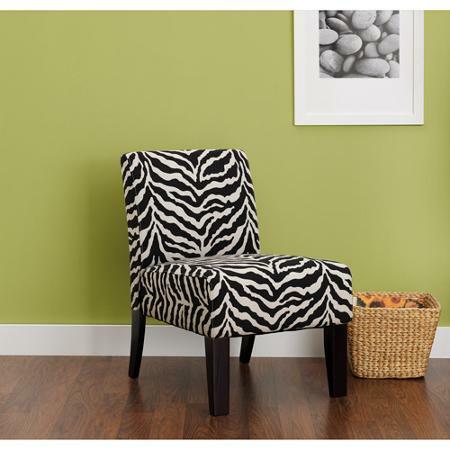 The Hometrends Accent Chair in Zebra Print requires assembly.